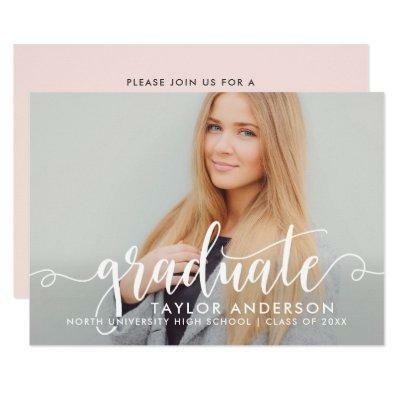 Stylish graduation announcement card and party invitation features a senior photo with "graduate" script overlay. Personalize the modern custom text with your grad&#;s name, school, and class year. This two-sided card design includes graduation party invitation wording on the back. The pretty blush pink and dark gray / soft black color scheme can be customized to coordinate with photo or party colors.